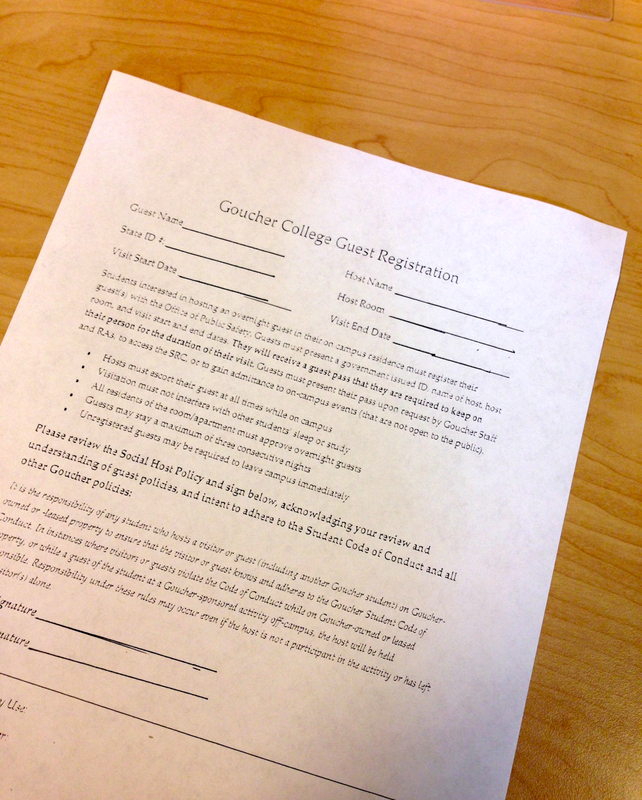 Goucher’s new guest registration form which was implemented to keep track of who is on campus. Photo by Anna Martin. On September 24, an e2campus alert was sent around campus regarding an escaped convict who was possibly hiding on the Goucher campus. Police helicopters flew over campus and it felt like there was a real possibility that a convict, dangerous or not, was on our campus. Although the convict was caught, I feel as though this incident highlights a number of issues with Goucher’s Office of Public Safety. It doesn’t appear as though Public Safety has a way of knowing who is on campus. Visitors don’t have to sign in, I.D.s aren’t checked, and there are about three ways of entering campus that avoid the gatehouse, which doesn’t even appear to be manned a majority of the time. Anyone can walk on campus. The new overnight guest policy—which requires students’ overnight guests to sign in, carry an I.D. and be escorted by their host at all times—is good progress, but it doesn’t do anything to prevent people from coming on campus, nor does it allow students to know who is on campus. It seems as though there have been many times when students who were not from Goucher have come on campus at night and either destroyed property or harassed Goucher students. How would Public Safety deal with people without an I.D.? What would prevent them from coming back on campus? Is there anything in place to stop them from coming on campus in the first place? Instead of dealing with the issue at hand, Goucher is only dealing with a symptom. And why aren’t people who enter campus during the day asked to sign in? While I’m aware that Goucher is an open campus and that the Athenaeum is open to the public, why isn’t there any way to know who exactly these people are or when exactly they’re on campus? I’m not asking to stop people from entering campus or using the Ath. I’m asking for a system to be put in place so that Public Safety can know who is on campus. The incident with the escaped convict, in my opinion, was not handled well. It absolutely failed the student body. While we were given a description of the person, we weren’t given her height, nor we were told what she had been convicted of. Was it a violent crime? Was there any possibility she was armed? Did she have any history of violence? While one can assume that since we weren’t warned of any of these issues, we were not in any immediate danger, the e2campus alert could have still said, “Suspect is unarmed and not dangerous. However, students are advised not to approach.” How hard would that have been? On a related note, it seems interesting that students were not advised to remain indoors or on campus. Some things, while they may seem obvious, probably should be said. It seemed almost lackadaisical to not make any suggestions to students on how to keep themselves safe. My other issue with how the situation was handled was the actions of the Office of Public Safety afterwards. Though the suspect was not found on campus, we were never told whether or not she was ever on campus, and, if she was, how she had entered. Why weren’t students informed about this? Surely we deserve to know more than whether the suspect had been apprehended. While the Head of Public Safety, David Heffer, did say that students were free to ask about the incident, I feel as though that is not going far enough. Instead, the information should have been freely given out to the students. Since the majority of us live here, we have a right to know. We shouldn’t have to make an appointment to find out about the aftermath of event such as this that happened on our campus. Goucher College needs to do better in protecting its students. The negative view of the Office of Public Safety doesn’t help matters. While I am aware that Heffer is new to his position and isn’t in the process of making any big changes yet, I hope this incident motivates him into making changes faster—because this is evidence that our system needs to change. Whether this means requiring all Goucher students to show their I.D. when entering campus, all people without an I.D. signing in (and out) and/or posting Public Safety officers at the other main entrance, it doesn’t matter. Goucher is a very large campus, and there are a lot of places to hide. The more we know about who is on campus, the better. The facts of the incident are important. The fact that I felt Public Safety didn’t do its job made me believe that this topic would best be handled by an opinion piece rather than a news article.